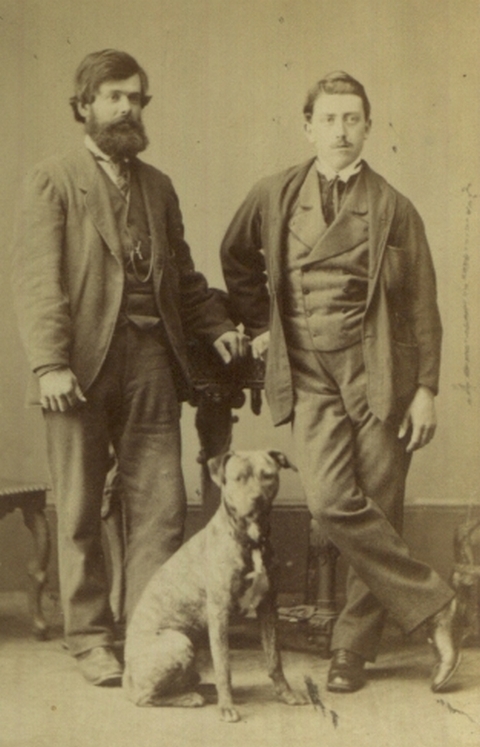 his Mate E R W Hayter & the dog Boswain. Ragusa is an old name of the city of Dubrovnik, Croatia. Primorac is a second name derived from Croatian name of Primorje = seaside, coast, littoral. So, Primorac = inhabitant of Primorje. Source of the photo The City of Ragusa. There are honored people in Croatian maritime history who contributed to the various fields of maritime affairs. One of them is Captain Nikola Primorac, born in Dubrovnik on July 27, 1840, who sailed in his small boat across the Atlantic from Liverpool to New York and back to Liverpool, England. Nikola Primorac came from Dubrovnik to Liverpool in 1870 searching for a better living. He found himself in a bar where seamen from all over the world used to gather and talk about ships, navigation and their sea adventures. There he made a bet with one Englishman for 100 pound sterling that he will cross the Atlantic in a small boat. It was sensational news in Britain which the London "Times" wrote: "It is an incredible brave and crazy adventure ever made that could turn into tragedy or triumph". Captain Nikola Primorac started to look for a boat that would cross the frightening and huge sea. He found the boat that once belonged to the whaling ship "Breeze" which was sunk in November 1869 in the Irish sea. He bought the boat which was 6.09 meters long, 1.82 meters wide and 0.86 meters high. Primorac built two masts and a bowsprit on the stem and self made gaff sails for foremast, the boat had also one square sail. The windmill mounted on the reinforced mizzen mast was intended to propel the boat during quiet weather. He supplied himself with necessary navigation instruments and food. The boat was named "The City of Ragusa". Since the Austrian Consul did not approve the boat to sail under the Austrian flag, he sailed under the English flag, which was very welcome by English authorities. The problem was to find another crew member. Just before leaving the harbor, Primorac found a drunk sailor named Buckley and embarked him on the boat. 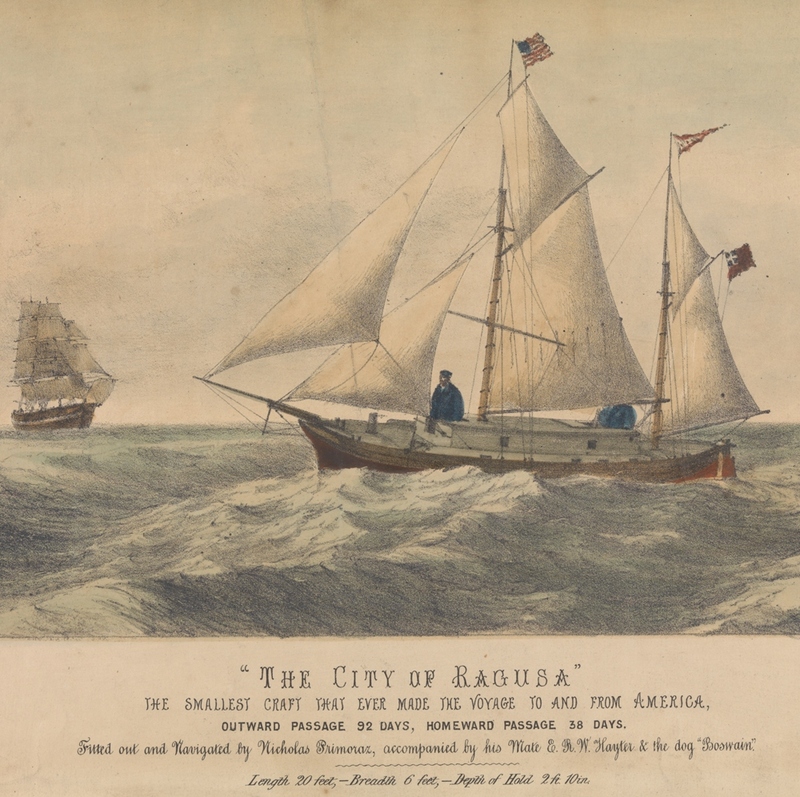 On June 2, 1870, the "City of Ragusa" sailed from the harbor of Liverpool. There were many people present, among them numerous representatives of government and journalists. The third member of the crew was a "newfoundland" dog called Boswain. The small boat would take the crew to uncertaint fate, while the astounded crowd on the pier was applauding the brave sailor Nikola Primorac. When "The City of Ragusa" reached the open sea, the drunk sailor sobered up and realized what happened to him. He was begging the captain to let him go and promised him to find a substitute crew member. Disembarked in the Irish port Queenstown, Buckley left the boat and a Dutch sailor E.R.W. Hayter joined Primorac. Sailing across the Atlantic took 92 days. After two days of calm and nice weather, the sea ran high so the brave seaman from Dubrovnik had to strike the sails and to use the so called storm anchor. It was hanging on the rope 25-30 meters long and attached to the stem. It enabled the boat to cut the waves with the stem and to keep a straight direction to the wind. During stormy weather, they were in the cabin and when the storm calmed down, Captain and his helper were setting sails again and directing the stem to their destination. One stormy night, the dog Boswain went out on the deck and fell into the sea , so two sad adventurers had to go on alone. Shipping authorities in England and America advised all ships sailing on the Atlantic at that time to help the boat "The City of Ragusa" if necessary. An American fishing schooner "Emma L. Rich" met the "nutshell" around New Foundland. The captain of the schooner offered them his help which Nikola Primorac kindly refused and sailed away. The captain of "Emma L. Rich" sent the information about "The City of Ragusa" successful crossing the Atlantic to Boston so the journalists reported the sensational news before September 8, 1870 when the boat entered port of Boston and New York afterwards. The welcome in America was magnificent, especially when captain Nikola Primorac announced that he was going to sail the same way back. After twenty days of rest in New York City, the boat sailed to Liverpool. Due to the stream and favorable winds, "The City of Ragusa" arrived in 33 days safe and sound to Liverpool. Many ships and tugs went to meet the boat; thousands of people wanted to shake hands with the brave captain Nikola Primorac. Queen Victoria congratulated and awarded Nikola Primorac and E.R.W. Gayter. The boat "The City of Ragusa" was exhibited in the Liverpool Museum until the end of the World War II, when the Museum was destroyed in bombing. Although a booklet about Nikola Primorac and his journey across the Atlantic has been published, it remained a rather unknown story. Splivalo. Bautovic. homeward passage 38 days. Fitted Out and Navigated by Nicholas Primoraz, accompanied by his Mate E R W Hayter & the dog Boswain. World history shows the sea has always been the source of prosperity, respect and culture for all the nations linked to it. This is time of the Croatian nation, too. Seafares are same sort of heroes who have permanently enriched the mankind by their explorations. In the whole seafaring tradition the Croatian seamen are among the first explorers of the unknown regions of the world, they have tamed the furious oceans, explored polar districts and having followed their vision of the winners over the sea, many of them have sacrificed their own lives. The Croatian seafaring tradition emerged from the mutual relationship between life and the sea. Such a tradition isn’t common to even more famous and more powerful seafaring nations in the world. We may suppose the seafarers of Dubrovnik were the first to settle in the New World – this may be proved by the fact many Indian words originaled form the Croatian ones. Even nowadays some people living in the North Carolina claim of having their origin in the Croatan – Indians. The inhabitants of Dubrovnik were known worldwide as the masters of astrology and great nautical experts. They were eager to attain the level aheady reached by the Portuguese and the Spanish seafarers. Under supposition that some seamen of Dubrovnik had been sailing on board Columbus’s caravels we may conclude the citizens of Dubrovnik would have learned about newly discovered parts of the world from the first hand. It’s believed that two seafarers of Sibenik, too were sailing on board Columbus’s caravels. This isn’t unusual at all having in mind the fact in the second half of 1468 the Turkish forces had penetrated into the region of Sibenik so that many of its citizens escaped from the town together with their families and found shelter on the nearby islands and even in Italy. It was there that they founded (together with other refugees form Dalmatia) the town of VASTO on the Adriatic coast. From there the most andacious ones being attracted by the new on recent discoveries, set off to Spain.